The garden is growing and will hopefully provide us with some meals one day soon. 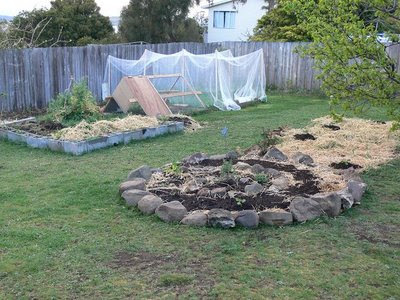 It now has a herb spiral (more for looks than proper permaculture function), seedlings growing in the vegie patch, an interesting L shaped bed of potatoes, more trees, more beds and less grass! The girls aren't really that interested yet. They love climbing into a pea tee-pee and munching some peas, or looking for worms or faeries, but green thumbs have not been discovered yet.